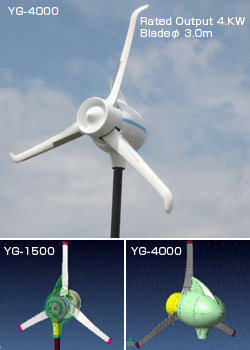 ﻿ Features of YG-Series - Next-gen Compact Wind PowerGenerator TWE [TOMO Wind Energy] || BIRUMEN KAGOSHIMA CO.,LTD. 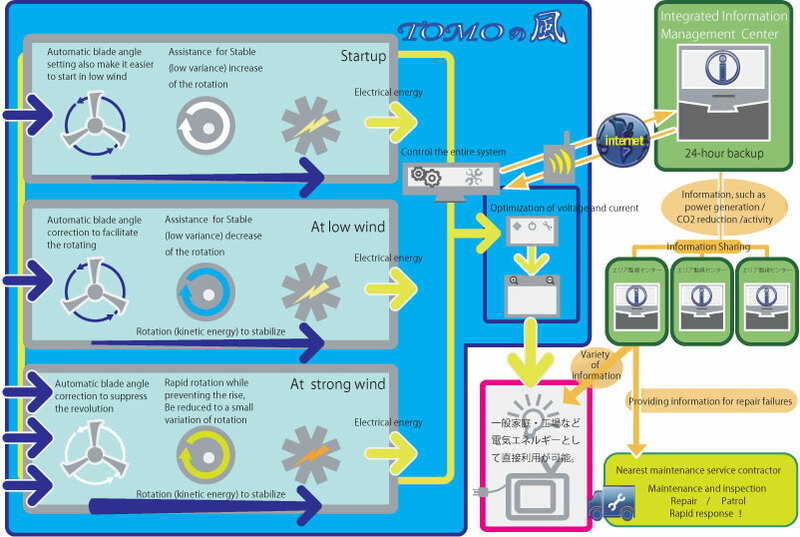 Next-gen Compact Wind PowerGenerator "TWE"
The output energy timecourses of commonly-used aerogenerators change grossly along with the inconstant power of natural wind. The newly deliverd "TWE" has a self-contained flywheel which stocks the unstable wind power as stable rotation energy. And the energy is converted to constant output of the "TWE". In the light wind, blade's pitch angle get high and rotation torque is increased, which males the wheel rotates continiously. Stronger the wind blows,lower gets the pitch angle. But the wheel rotates fast. When the wind speed exceeds 12m/sec, the pitch angle get the highest and the wheel rotation speed stalls. This product is "communications equipment for monitoring" connecting to the Internet has been built. It will send the real-time information obtained from the controller to "Integrated Information Management Center". This way, we are managing the operating status of the product were placed around, centrally. Monitoring contents are the more power situations, of course, environmental informations such as wind power, and other mechanical problems. By feeding the information to be integrated to "Area's Control center" for each area, We provide informations to end users.The informations provided are variety of informations relating to the operation of each TWE, and the information on the total power generation by region, and so on. At the same time we check on the repair system for the prompt service. ※Data showing the stable output of the TWE.